AP Government Jobs 2016-2017: The Government of Andhra Pradesah has been released the notification to fill the 33738 vacancies. The Andhra Pradesh Public Service Commission, AP Police Department & Andhra Pradesh DSC has going to recruit the eligible candidates for the required vacancies. The good news for the can didates who are looking the latest govt jobs in Andhra Pradesh can apply the AP government jobs 2016. The start date of the online application will start soon. If you want to know the latest news about the upcoming govt jobs in AP, you must like out social page (Facebook, LinkedIn, Google+ & Twitter). Our team member are fully focused on the latest jobs in India. We will update the current & upcoming jobs in AP 2016. Here you will get the direct link for the online application and notification. APPSC (Andhra Pradesh Public Service Commission). Total Number of Vacancies: 33,738 Jobs. Andhra Pradesh Public Service Commission: 11, 250. Andhra Pradesh Police Dept: 11,623. Civil Assistant Surgeons: 575 posts. Civil Assistant Surgeon/DSC: 1140 posts. Agriculture Extension Officer: 393 posts. 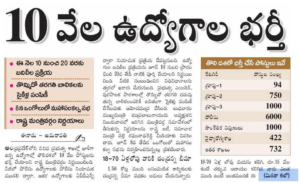 The Andhra Pradesh government of has soon to released the AP Govt jobs 2016 notification. We will update the other details like educational qualification, age limit, how to apply, application fee, selection procedure & other information given here. The candidates are advised to keep visiting our Indrajobinfo portal for instant job updates. This is one of the excellent job opportunity for the candidates, so the applicants can utilize the latest jobs in AP 2016. The candidates who are waiting for apply the Andhra Pradesh Government jobs 2016 can apply this recruitment. Latest Govt Jobs in Andhra Pradesh 2016-2017.